Old Bridge Township is a township in Middlesex County, New Jersey, United States. As of the 2010 United States Census, the township had a total population of 65,375, reflecting an increase of 4,919 (+8.1%) from the 60,456 counted in the 2000 Census, which had in turn increased by 3,981 (+7.0%) from the 56,475 counted in the 1990 Census. As of the 2010 Census, the township was the state's 18th largest municipality, after being the state's 21st most-populous municipality in 2000. Old Bridge is a bedroom suburb of New York City located across the Raritan Bay from Staten Island, and it is about 25 miles from Manhattan, and about 30 miles south of Newark. 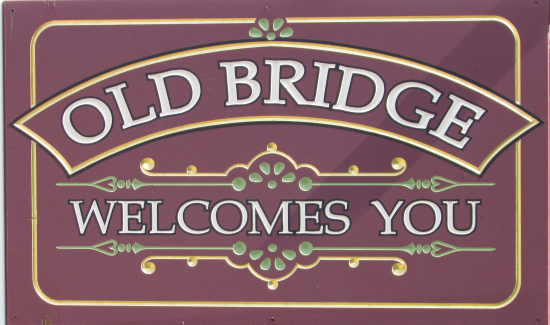 What is now Old Bridge Township was originally incorporated as Madison Township by an act of the New Jersey Legislature on March 2, 1869, from portions of South Amboy Township (now City of South Amboy). In a referendum held on November 5, 1975, voters approved changing the township's name to Old Bridge Township by a margin of 7,150 votes to 4,888. The township's name was changed to avoid confusion with the borough of Madison in Morris County. Use of the name Old Bridge for a location "on the Camden and Amboy Railroad, about eight miles beyond South Amboy" or "about seven miles from South Amboy" goes back, however, to at least 1853. Initially, the township was made up of farms and the population grew slowly. In 1880, the population was 1,662 and in 1950 it had reached 7,365. Over the next decade, a building boom started and farms gave way to developments, and the population grew to 22,772 by 1960. The 1980 census cited 51,406 people. The township saw major changes with the extension of Route 18 to the shore. The township was named as a contender for the title of one of the best places to live in the United States by Money magazine in both 2005 and 2007. In 2016, SafeWise named Old Bridge Township as the sixth-safest city in America to raise a child; the township was the second-highest ranked of the 12 communities in New Jersey included on the list.